Moving weight rearward in the putter reduces skidding for a truer roll, while the polarity of the tungsten weights provides the stability on off-center hits that keeps putts on their intended line. Dual Density Weighting Combining a lightweight aluminum body (65% lighter than steel) with high-density tungsten weight plugs moves weight away from the clubface to reduce skidding on putts of all lengths. Polymer Insert In addition to enhancing feel, the soft polymer insert keeps the ball in contact with the face longer to promote a truer roll. The ultra lightweight (63% lighter than aluminum) polymer also allows for more perimeter weighting, which increases club head stability. 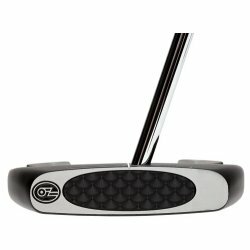 Face Balanced The T130 Putter, like All OZ Black putters, are face balanced to promote a square face at impact. Computer Numerically Controlled Milled Face Each putter face is milled flat to precise tolerances to enhance accuracy and predictability across the clubface. Dual Site Lines The dual site lines facilitate squaring the clubface at address to keep putts on target. C-Thru Grip by Lamkin This soft, high-tack thermoplastic rubber paddle-style grip provides for a comfortable, solid feel. From John of Westport, Connecticut on 7/12/2007 . This is the best putter I have ever had. From Jimmy of Boston, Massachusetts on 7/12/2007 . This putter is sleek, comfortable, and easy to use. Highly recommend it.